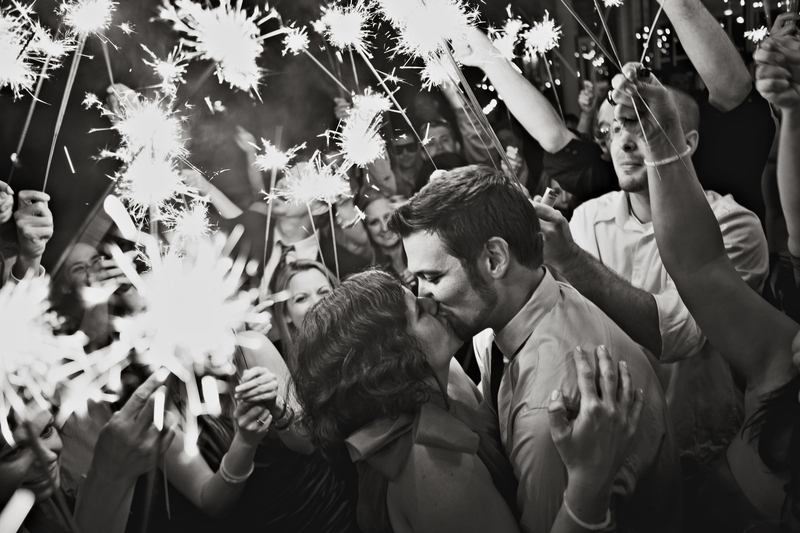 Wedding sparklers are becoming a very popular addition to modern day weddings. While many people have started including the 36" wedding sparklers offered by Wedding Sparklers Outlet as part of their wedding exit instead of confetti or rice, there are many other uses for them. In fact, you can incorporate them into almost every aspect of your wedding day, you just have to be prepared to think outside the box. Here are a few ways you might incorporate them into your special day. You only get one shot at your wedding photos; there are no "do-overs" or second chances. With this in mind, you should consider adding plenty of 36" wedding sparklers and letting your guests incorporate them into the photo shoot. The sparkling light is a wonderful way to add a touch of romance and magic to the photographs. Perhaps the husband and wife can hold our heart-shaped wedding sparklers for some of the pictures. When the time comes for you to cut the first slice of wedding cake, you can light up the cake with several smaller wedding sparklers and give your guests a treat. Of course, you can always go all out and put a sparkler on each slice of cake before you start handing them out to your guests (for slices of cake you may wish to go with our 10” wedding sparklers). When the time comes for your first dance as husband and wife, hand all of your guests 36" wedding sparklers and have them light them. Then have the DJ announce the first dance so that your guests can surround you in sparkling glowing light while the two of you enjoy your first dance. Not only will this make your dance more romantic, it will definitely make for some spectacular photographs to add to your scrapbook. When the time comes for you to leave the reception and head off on your honeymoon, have a bucket of 36" wedding sparklers sitting by the door along with matches or lighters. Your guests can grab one and light it on their way out the door ahead of you. Once everyone is ready, they can use their wedding sparklers to form a long, illuminated path ready to shower you in magical light as you walk towards your vehicle. As you can see, there are many different ways in which you can incorporate wedding sparklers into your special day. These are only a few! The idea was to get your creative juices flowing so you can come up with your own ideas to make your wedding day one you will always remember.